In AODocs, you can create a library from scratch. You'll create a blank library without any pre-existing configuration. Important: Only library creators can create a new library. This role is defined and managed at the domain level by the by super administrators. Learn more: Manage library creators. 3. The Create library panel opens. The three types of AODocs library are listed, each with a description. You can press Learn more to access tutorials. 4. Press Create in one of the boxes. 5. In the library creation pop-up, enter the name of your new library. 6. Select a storage account for your new library. Note: If you have only one storage account configured on your domain, it's selected by default. If several storage accounts have been configured, select the storage account you want to assign to this library from the list of available storage accounts. Your library is now created. For Document Management libraries and Secured Folders, you are redirected to the homepage of your library in the AODocs user interface. For Team Folders, you are redirected to the root folder of your library in the Google Drive Interface. 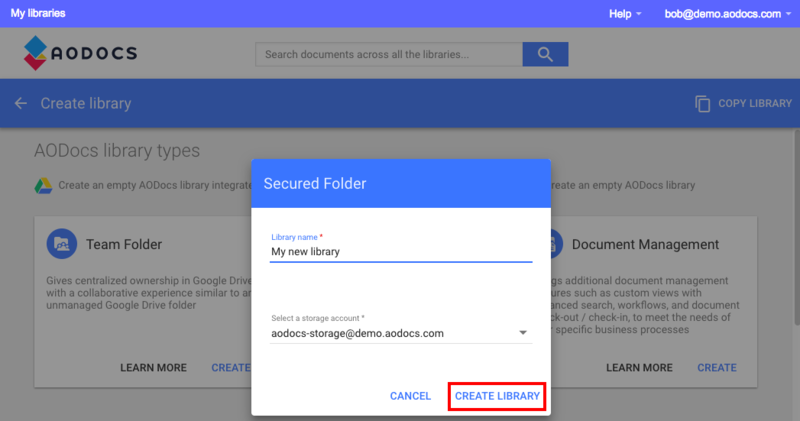 You can then switch between the AODocs interface and Google Drive. Once the library is created, the library creator receives an email to confirm that the library has been created. 8. Start configuring your library.